I had a bunch of leftover homemade focaccia bread from this weekend. Brandy and Gina came to town for a visit and we all had watched the Netflix show, Salt Fat Acid Heat. In the Fat episode, Samin was in Italy and made this homemade Ligurian focaccia that looked incredible. I mean, homemade bread is always good but this one looked so fluffy and good. It also looked pretty easy and for someone (me) that hates yeast, that is saying something! Anyway, so we made a giant sheet pan full and we only ate half of it. 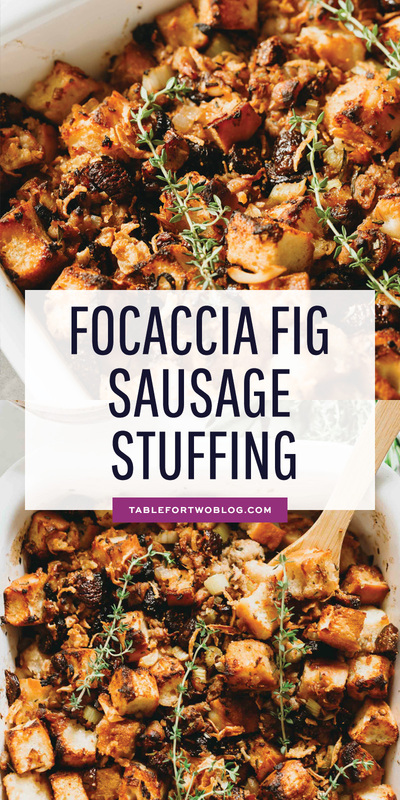 Which is how this focaccia fig sausage stuffing was born! 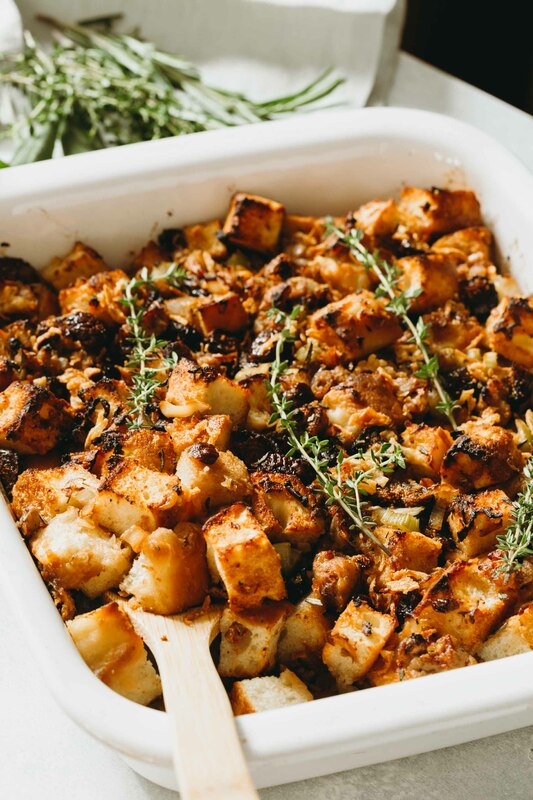 Do I have to use focaccia bread for this stuffing? No, you can ideally use whatever stiff structured bread you want. I highly recommend something like sourdough or a white bread. Should I use day old or fresh? Day old or even a couple days old! You want it dried out. You could cube it and leave it out on a baking sheet too. What kind of sausage did you use? Trader Joe’s maple and cranberry chicken sausage! It was the perfect added sweetness! What if I can’t find the Trader Joe’s maple and cranberry sausage? What can I substitute it with? If you can’t find it, you can use sweet Italian sausage. You’ll want the FRESH kind. Like the one in a casing that you have to peel out of the casing and break into pieces in the skillet. Can I use any other dried fruit? Yes! Dried cranberries would be classic but you could use whatever dried fruit you want. Dried apricots would be a good option too. Can I use fresh figs? I wouldn’t recommend it. It would fall apart and get so mushy in the stuffing. 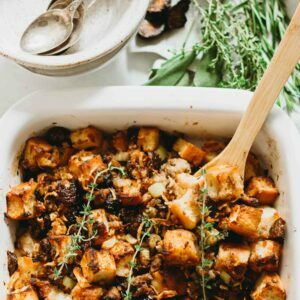 You want structure in the stuffing and not a ton of moisture. Do I have to use fresh herbs? It’s the best! Especially for Thanksgiving time. If you can’t get your hands on fresh herbs, then you could use dried but I’d start light with 1/2 teaspoon of each and base it on taste. Can I use chicken stock? Yep. You can use whatever stock you want. Vegetable stock, chicken stock, turkey stock (what I used), beef stock. Can I add cheese to this? Yes! I didn’t because I really wanted it to have a different flavor profile without cheese. 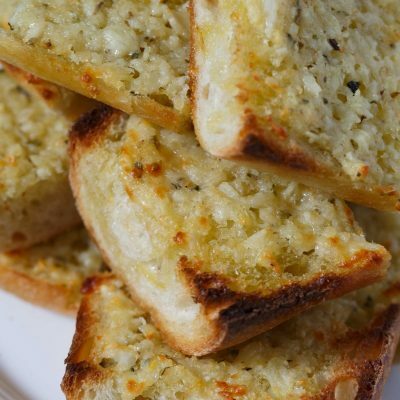 Parmigiano reggiano would be a good one to mix in with crumbled feta. 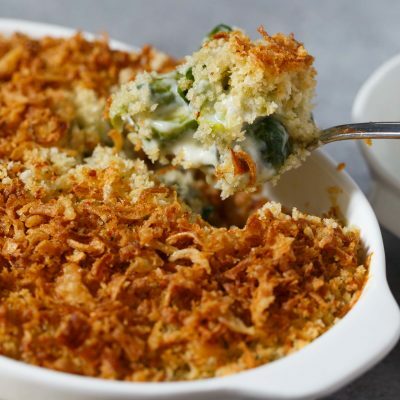 Or shredded gruyere on top would be great too. Can I prepare this ahead of time? But I’d keep the filling separate from the bread. Because it’d end up getting soggy. So I would prep the filling separately and then toss it together with the bread before you are to bake. I haven’t tried but I would probably say yes? And just add a little more stock in the baking sheet prior to baking and bake it covered so it kind of steams it all together and then remove the cover in the last 15 minutes or so of baking. 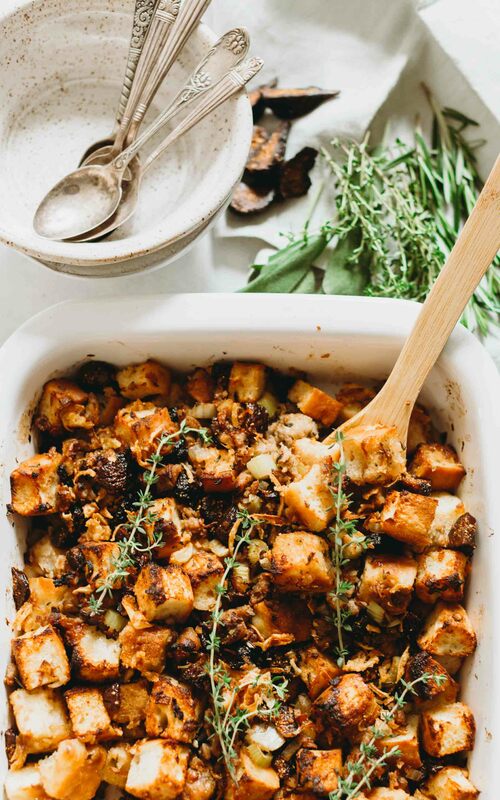 A fresh new take on the classic Thanksgiving stuffing side dish! 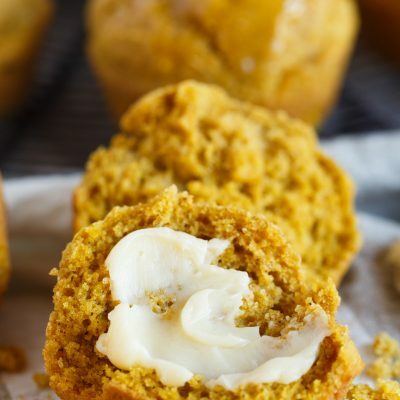 This one is for those savory sweet lovers! 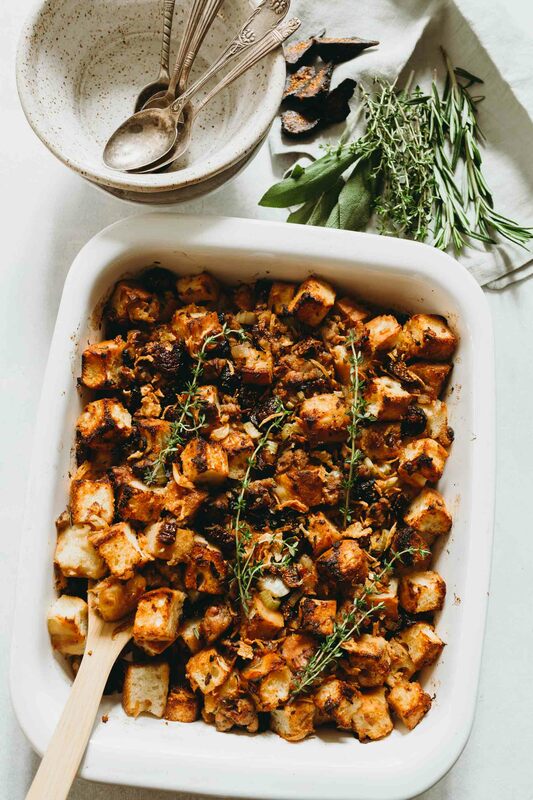 Preheat oven to 375 degrees Fahrenheit and have a 9x13-inch oven-safe casserole dish ready. 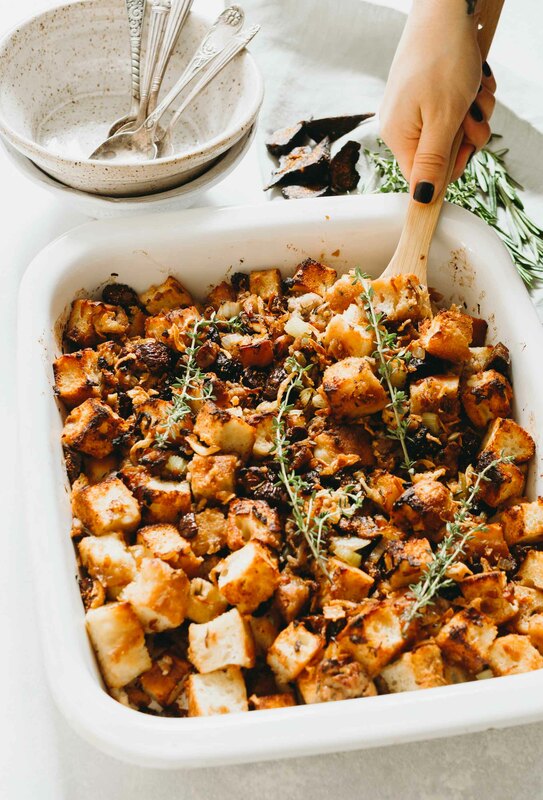 In a large bowl, place cubed bread in and set aside. In a skillet over medium-high heat, add a little bit of olive oil or butter. Once heated up, add the sausage and break into pieces with a wooden spoon or spatula and cook until browned. Add in the celery, onion, and garlic. Cook until tender, about 5 minutes. Add the fresh herbs and dried figs. Toss to incorporate. Add the turkey stock then season with salt and pepper. Remove from heat and pour mixture into bowl with bread. Toss to incorporate evenly. Pour mixture into baking sheet and spread into an even layer. Sprinkle fried onion pieces on top, if using. Bake, uncovered, for 15-20 minutes or until mixture is warmed through and the top is beginning to brown. Once done, remove from oven, let sit for 10 minutes then serve (with more fried onion pieces on top, if desired). Just finished the Salt-Fat-Acid-Heat Series on Netflix. LOVED IT!! Any foodie needs to watch. I was super interesting and made for some great TV. Sounds wonderful! 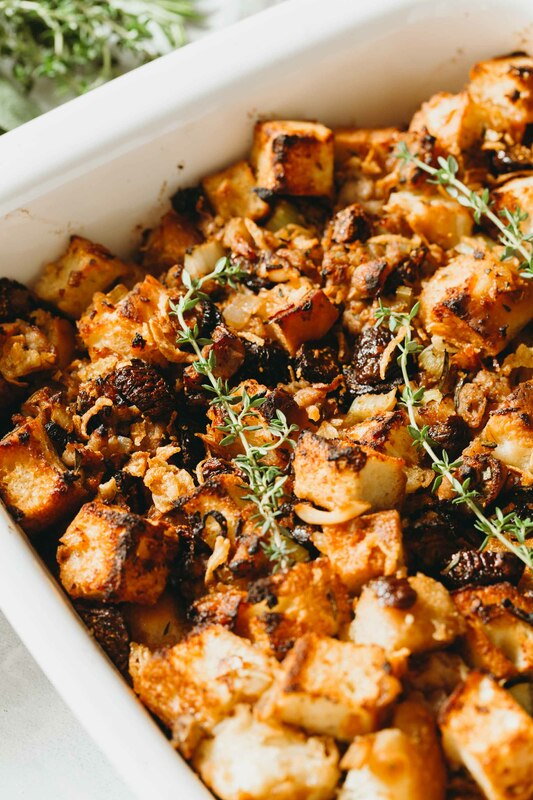 Figs seem to be having a moment…Two years ago I made a fig and fennel stuffing using a carmelized onion and balsamic ciabatta.